Ambulance 255 donor card. RG1/001, the American Field Service World War I Records. This image cannot be reproduced outside the guidelines of United States Fair Use (17 U.S.C., Section 107) without advance permission from the AFS Archives. 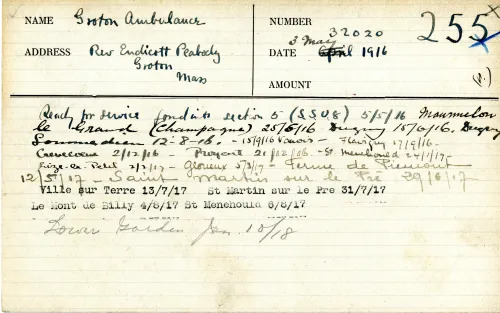 This ambulance donor card was kept internally by the American Field Service (AFS) in order to monitor and track the specifics of each donated ambulance during World War I. AFS led large-scale fundraising efforts during the war, and many individuals and organizations donated funds for the purchase of ambulances. Donors were then sent unique certificates of service, which included details about the AFS section the ambulance was placed into. Funds for this particular ambulances were donated by the Groton School in Groton, Massachusetts, in 1916. Thirty-two students and graduates from the Groton School volunteered for AFS during the war, which likely contributed to the school’s desire to donate. The Groton Ambulance was given the number “255” by AFS and “32020” by the French military, and was placed with Section Sanitaire [États]-Unis (SSU) 8. The driver was Massachusetts native Oscar Anthony Isaigi, a chemical engineering graduate from the Massachusetts Institute of Technology. Though the original no longer exists, the AFS ambulance numbered 255 was recently reconstructed as part of a private project, using an original ambulance chassis and the same wood and hardware used to construct the original. The reconstructed ambulance was featured in U.S. President Barack H. Obama’s second inaugural parade in January 2013.